I would like to start from the beginning for those new followers and anyone who doesn’t fancy Facebook and who may not be up to date on Abbigail’s prognosis and progress. One year ago surgeons successfully removed Abbigail’s cancerous tumor. Some might think that once the cancer was gone that she would return to the life of an average toddler, which was not the case. She endured 12 months of chemotherapies, transfusions, treatments, immune altering drugs and countless procedures that brought heavy tears and frightful moments to her not-so-average life of an oncology toddler. That moment when the surgeon walked down the long narrow hallway to take me to her, in our minds, she became cancer free. This did not mean that the battle was over, this had meant we dealt with the obvious and that the true fight begins. Abbigail endures regular scans to ensure that her cancer has not hidden itself and that she does not relapse. Neuroblastoma does have a relevant relapse rate, hence the numerous scans. We are however optimistic after her 1 year scan last week, which came back clean as a whistle, that she continues to be cancer-free and that she will continue to beat the odds.For those of you unfamiliar with much of Abbigail’s diagnosis, she is indeed a case for the books. She is 1 in ten million a year that are diagnosed with this rare diseased indirectly caused by her cancer. Opsoclonus Myoclonus Ataxia Syndrome (OMS) is life altering and can be very debilitating at times, especially for a toddler, and it currently has no cure. When Abbigail first was diagnosed, she couldn’t stand on her own, she couldn’t walk, nor barely crawl and even sitting up alone was a task. This is not close to the average for a 22 month old, given that she was running, climbing, self feeding, and keeping up quite fine with her 4 year old brother just weeks prior. Abbigail went from an above average 22 month old to barely being comparable to a 9 month old. She began quickly losing motor functions, both fine and gross, shaking tremulously, unable to keep eye focus (darting eyes), confusing prior learned sounds/words and being quite irritable and inconsolable at times. Once diagnosed and a treatment plan was researched and decided on, we put one foot in front of the other and pushed through the next day. Abbigail began a year of more than I ever expected. I did my research, I read more studies than I did books in my 30 years, I may have gone through more literature in the last 52 weeks than our oncologist has when it comes to OMS. I was prepared…so I thought. We went into her first day of treatment with the understanding that in 12 months she would be back to health with perhaps a few minor setbacks that would easily be overcome and some mild side effects from her treatments. Watching the other sweet kids walk in and out of the oncology playroom with numerous cancer treatments hanging from their IV poles, hearing the other moms talk about how this was their 15th trip to the ward this year and seeing the size of some of the children’s charts on the shelf, we had it easy we thought. Now, 52 weeks later, 3 treatment plans unsuccessful, we too have had to push a heavy IV pole with three pumps attached to it, and I laid awake in my daughter’s hospital crib crouched at 9 months pregnant just to hold her while she endured yet an other sleepless night attached to too many wires and her charts too are so large they require numerous binders on the shelf. In March 2012 Abbigail started her first treatment protocol, which consisted of high dose steroids orally at home on a daily basis, in addition to the other oral medication to control the treatment side effects and she received intravenous chemotherapy and intravenous immunoglobulin (IVIg) transfusions every 28 days. If that wasn’t enough for her little body to endure, she underwent weekly blood tests and office visits with her oncologists at CHEO. Abbigail’s acute symptoms, the obvious physical ones of walking and standing improved significantly, however never returned to anything near that of a 12 month old just yet. Then throughout the summer months we began to see her symptoms return and she began once again to deteriorate. She began shaking again regularly, her eyes would dart numerous times in a day and her awkward and uncoordinated balance became more and more obvious as the weeks went by. It was decided by her team of oncologists that this first treatment plan didn’t succeed, and that we would begin the search for a new treatment plan, which came recommended by a doctor in the United States. This next plan consisted of much of the same however rather than daily immunosuppressive steroids we went to a higher dose pulse therapy in addition to the IVIg and side effect medications. Come November 2012, although we saw her walking more and shaking less, her gross motor skills took a back seat to her now cognitive symptoms. We experienced some of the darkest and toughest days yet. 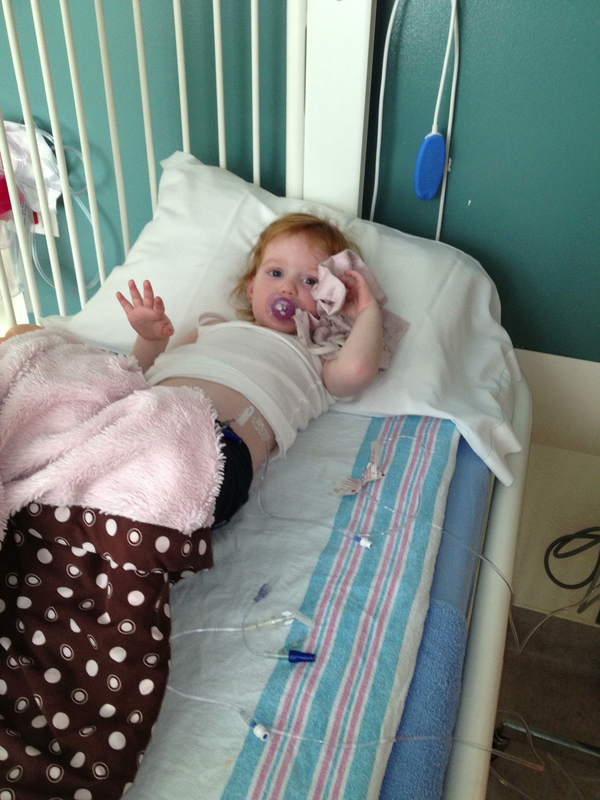 We were losing that bright bubbly baby girl to such frightening and dark symptoms. It was and is so hard to watch our once joyful little girl slowly slip away and viciously lose her sparkle. Now, pushing the lump in my throat further down, as we run through an other treatment plan, we again, in part with our oncology team, consulted with the same doctor from the United States who is as experienced as you can be with OMS, and we came up with an other plan and it started immediately. This plan consisted of an unapproved course of treatment for her diagnosis however one that proved promising in the little research there is out in the world for OMS. Hope was restored and although the battle was nowhere near over, we had a plan again. Abbigail endured four more weekly rounds of a different targeted chemotherapy, throughout the month of December; her last treatment was January 3rd! She received her treatment of IVIg transfusion on January 18th and February 15th as she had been for the last 12 months as well as continued to receive steroid treatment at home. That brings us to the present. Abbigail saw a number of weeks in December and January where her physical symptoms and motor skills appeared near average for a 2 year old (she is almost 3) and her rage, behavior, mood and overall irritability had improved enough for us to breath again. Her sleep disturbances continued however we felt that was bearable. Come February, we noticed that each day Abbigail got increasingly worse. She now requires a supplement to sleep, otherwise I am up with her a lot, sometimes up to 8 times a night, which is only exacerbating her OMS symptoms. She spends many hours a day screaming or fighting herself in a fit of rage, sometimes inflicting pain on herself or her siblings and us. Her walking is still leaps of improvement as we look back on one year ago, however she tends to be uncoordinated more and more and her ataxia (shakiness) has gotten more evident over the last month; more often when she is tired, which feels like all the time now. I know these symptoms all too well and I recognize them, their patterns and how her body and immune system tend to react to them on a daily basis and that is why I have no doubt in my mind, my heart and my gut when I say that she has yet to induce a neurological remission. This is why we decided to start an other course of treatment. Her oncologist agrees, that she has not reached her “potential” yet and that we can not take any chances of letting her immune system go on the attack again, risking further brain damage and life long sequelae. So for the month of March, Abbigail will endure yet an other course of chemotherapy, every Friday until Easter. Abbigail may exhibit symptoms that would make most strangers sneer or stare and she might not be up cognitively with her soon to be classmates, but she is still our little girl, she still loves playing dollies and dressup, and she adores her big brother. I could go on and on about how she is, how I wished she was and how she steals my heart each and every smile regardless, but I will save some fun for an other day and many more posts. I realize this was long, but now that you are all up to date on her prognosis and progress with this brave journey, I invite you to continue to follow her journey through my eyes here and to like her Facebook page http://www.facebook.com/KissesForAbbigail for fun photos, quick updates and interactions.